October 18, 2004: Six … long … years. Solar physicist David Hathaway has been checking the sun every day since 1998, and every day for six years there have been sunspots. Sunspots are planet-sized "islands" on the surface of the sun. They are dark, cool, powerfully magnetized, and fleeting: a typical sunspot lasts only a few days or weeks before it breaks up. As soon as one disappears, however, another emerges to take its place. 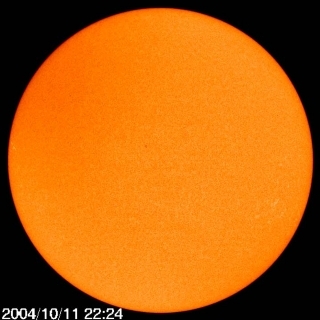 Even during the lowest ebb of solar activity, you can usually find one or two spots on the sun. But when Hathaway looked on Jan. 28, 2004, there were none. The sun was utterly blank. Left: The blank sun on Oct. 11, 2004, photographed by the ESA/NASA Solar and Heliospheric Observatory.